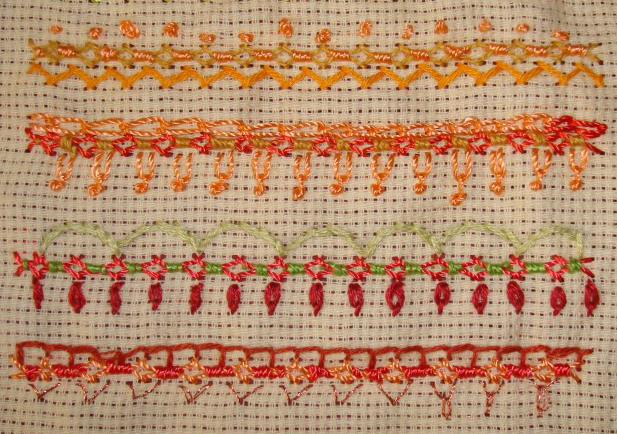 Some samples of fancy hem stitch combined with other TAST stitches. 6.Fancy hem stitch rows are combined with french knots and herringbone in the first sample, and with chain stitch and Italian border stitch in the second sample. 7. The first sample has stem stitch and detached chains , the last sample has buttonhole and wheat ear[also arrow head] stitches. The sampler was completed with these stitch combinations. I like this stitch in combination with other stitches. An easy stitch to work and makes a nice border. Some more samples of this stitch were worked on this sampler cloth. 4. Angled stem stitches were tied to work this broad and narrow version of fancy hem stitch in the first sample. A single line of stem stitch with straight stitches worked above and below created this zigzag fancy hem stitch in the second sample. 5. The first sample is worked on four row of stem stitches in two colours. The stem stitches were angled to work these dancing fancy hem stitches in the second sample. The third sample also has angled stem stitches in such a way that one side is taller than the other. This was one of the stitches I missed when I was in India for three weeks. The working of this stitch is on SharonB ’s blog. I had done the sampler of this stitch during the previous challenge. This week some more samples were worked as part of this challenge. The first part of the sampler. 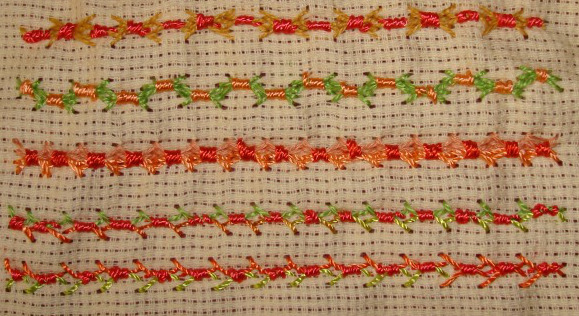 1.Three rows of fancy hem stitches are worked together and the stem stitches in the middle row are worked in different colour in the first sample. Four rows of stem stitches are worked and alternate ones were tied to form a pattern in the second sample. 2. The wide and square version are worked alternatively in the first sample. Another variation of two rows of fancy hem stitches are worked together in the second sample. Fancy hem stitches are worked with a space between in the first row. 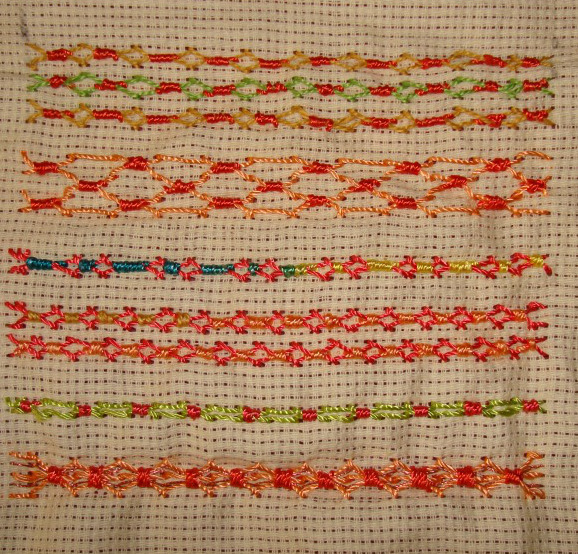 Five rows of stem stitches worked with polyester thread and metallic thread, these five rows were tied to work this broader row in the second sample.